HHS' Health Resources and Services Administration has reposted the public-use file of its National Practitioner Data Bank, but it has done so with conditions that one critic doubts will work and another calls "unacceptable." The data bank's public use file contains de-identified information on disciplinary actions against physicians and, in a statement posted on the data bank's website, HRSA Administrator Mary Wakefield touts this data as being available for statistical analysis and reports on malpractice trends. The public use file had been removed from the website on Sept. 1 after a Kansas City Star reporter was able to ascertain the identity of a doctor by comparing data in the file with court records. So now, in order to gain access to the public use file, individuals will have to agree to terms in a new data use agreement that requires that data in the public use file cannot be used in combination with other information sources to identify individuals involved in disciplinary or legal proceedings. If data are used for that purpose, under terms of the agreement, the individual will be required to "return, delete or otherwise permanently dispose of all copies of the data that are in their possession." 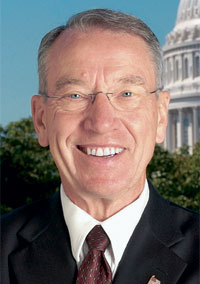 Sen. Chuck Grassley (R-Iowa), who has been crusading for the restoration of the public use file, was not satisfied with terms of the data use agreement. Dr. Sidney Wolfe, a member of the data bank's executive committee and director of the Public Citizen consumer advocacy group's Health Research Group, also criticized HRSA's move. Wolfe noted that an increasing number of medical boards were posting the names of doctors involved in disciplinary actions, and that Public Citizen will join with others “to liberate the other half of this important loaf” of information. Grassley also said he would seek opinions as to whether HRSA was accurately interpreting the legislation that created the data bank.